Have you ever thought about the way “keeping up with the Jones’” applies to art? There’s probably never been a time in the history of art when patrons of art haven’t wanted to show that they were “with it” by showing the latest, most fashionable trend in artwork. Heck, after the ancient Roman’s invaded Greece, Greek art flooded into the homes of the wealthy so that they could show off their sophistication to each other, such was the esteem for Greek art on the part of Romans. For many centuries in Japan, the influence of Chinese art dominated what was “the latest thing.” In more recent centuries, in the West, the discovery of the ruins of ancient Roman Pompeii in the mid-18th century initiated a two-century love affair with all styles past. Imitating styles from the past is called revivalism, or revival styles. Americans in the nineteenth century (well, wealthy ones, anyway) trashed whole houses of colonial furniture to “modernize” their homes and show that they were aware of the latest trends. Revivalist art styles affected all art forms, but especially architecture. Revivalism really took off during the nineteenth century, in part as a romantic reaction to the impersonal nature of the industrial revolution. Mass production of objects, including furniture and art, caused people to hark back to the “good old days,” firmly rooted in the prevailing trend of Romanticism. No past style was safe from “updating” during the nineteenth century, especially in the United States. Initially, classically inspired styles such as Greek Revival and Roman Revival were madly popular in the US because of the perception by Americans that American democracy was based on the “democracies” of antiquity. By the mid-nineteenth century, however, there were revivals of Italian Renaissance (called Italianate or French Chateau), ancient Egypt, Gothic, Romanesque, and Baroque art. Even the florid Rococo style received the revivalist treatment mid-century. The Gothic Revival style was popular for public buildings, churches, of course, and even mansions and more modest private homes. It was introduced in the United States in the early 1800s, having been revived in the late 18th century in England in such buildings as Strawberry Hill. The style was popularized for domestic architecture in 1850 with the publication of architect Andrew Jackson Downing’s (1815-1852) book The Architecture of Country Houses. Although rare in pure, historically accurate renditions in America, it was adapted in a variety of ways, remaining popular through the 1930s. With the invention of the jigsaw, Carpenter Gothic flourished in ornament on existing houses. When I first moved to New England from Chicago, I was fortunate to visit Kennebunk, Maine and see this wonderful example of Carpenter Gothic. 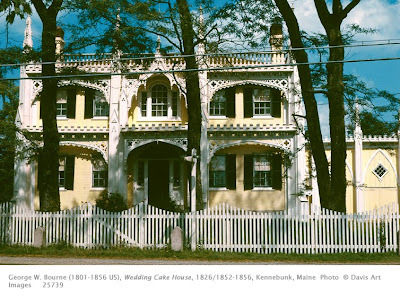 Around 1850 retired shipbuilder George W. Bourne decided to “update” his lovely Federal style house (from about 1826) into the “latest craze,” the Gothic “taste. This house shows the typical jigsaw ornament applied to houses to give them the Gothic look: buttresses with finials, pointed arches, cornices ornamented with pierced carving, and crenellation in imitation of the tooth-like ornamentation on medieval castles. The overall effect, aesthetically, is not unpleasant, and pays homage to the earlier English Gothic Cottage form. But, it is a nineteenth-century example of modernization for modernization’s sake. Interesting article. Everyone probably has their favourite revival style. Admittedly they are not all to the same standard, some are even quite shockingly bad, but a fascinating era in design history. I also love the retired shipbuilder story, as amateur enthusiasm was a powerful force in revivalism which could achieve both spectacularly good and bad decoration, often in the same building. Bourne's house sounds like the real deal. Thank you for this article. I wonder what you think of the art history terms "neostyle" and "historicist style" instead of revival/ist. Not my choice, by the way.